Voice memos should appear as a playlist in iTunes. But they will only appear if you move them there in the first place. If you have never moves your voice memos to iTunes before and you are afraid you will lose them if you sync with iTunes, the following article will offer you a great solution to add the voice memos to iTunes without losing them. One of the easiest ways to get the voice memos in iTunes is to transfer them to your computer first and the drag them into iTunes. The problem is that there are no easy ways to transfer data from an iPhone to the computer. Most are tedious and not very effective. One of them however, is quite the opposite. iMyFone D-Port is an iOS data exporter that will help you move all your voice memos from your iPhone to the computer quite easily. Its features include the following. Allows users easily access iCloud data and iTunes backup even if you don’t have access to the iOS device. 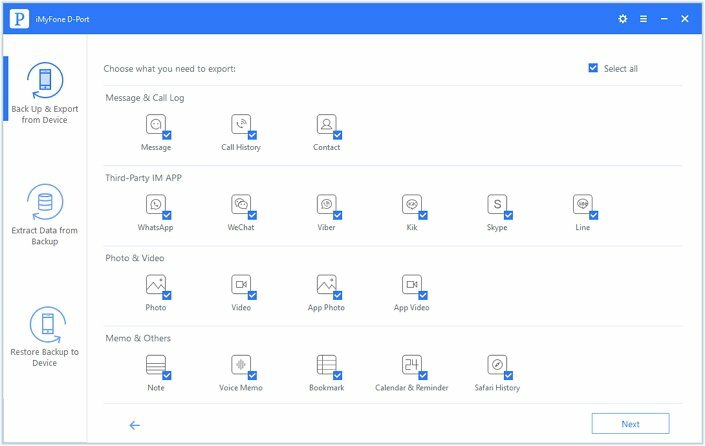 You can use it to export up to 18 different types of data such as messages, photos, contacts, notes and more from an iPhone, iPad or iPod touch to your computer. 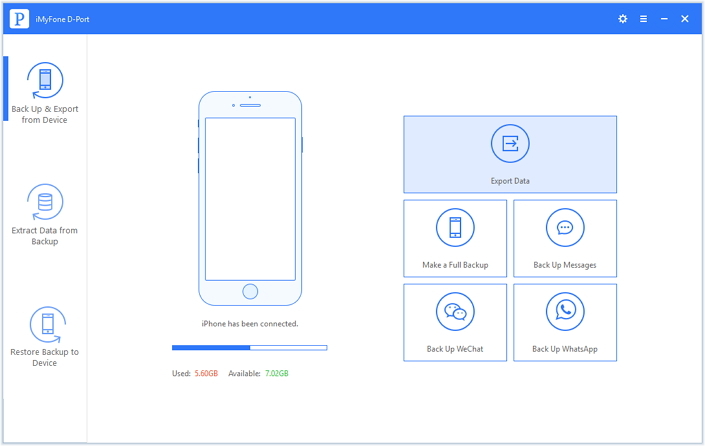 You can also use it to create a backup of all the data on your device or just backup your iPhone messages, WeChat and WhatsApp data. Begin by downloading and installing the program on your computer. Once that is done, launch iMyFone D-Port and then follow these simple steps to transfer the voice memos to your computer. Step 2: On the next window, you will need to select the type of data you want to export. In this case, you choose “Voice Memo” Click “Next” to continue. Step 3: The program will begin scanning the device for the selected data. Once the scanning is complete, choose the voice memos you want to export from the results in the next window and then click “Export” to save the data to a specified folder on your computer. Step 4: Once the export process is complete, all you have to do is launch iTunes and then drag and drop the transferred memos into the Voice memo’s tab in iTunes and you’re good to go. 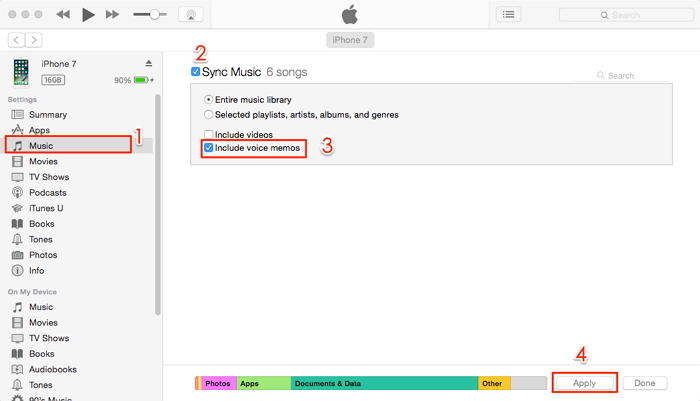 You can also simply transfer the voice memos to iTunes using iTunes itself. The following is how to go about doing that. Step 1: Download and install iTunes on your computer. If you already have iTunes on your computer, check to ensure that you are using the latest version of iTunes. Step 2: Connect the iPhone/iPod to your computer and then launch iTunes. Step 3: Click on the device button at the top left of the window. Step 4: Select the Music tab and then select “Include Voice Memos.” Click Apply and the voice memos will sync to iTunes. 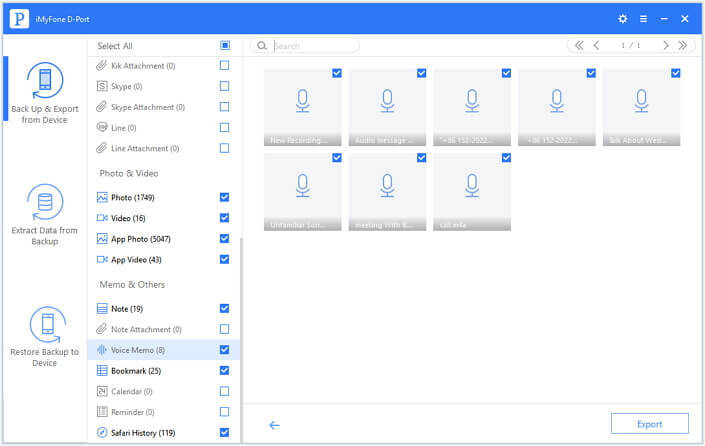 The voice memos will be stored in a folder named “Voice Memos” within iTunes. You can view them in the Voice memo playlist under the Playlists menu in iTunes.